Connect any wireless devices to the wireless network (WiFi) of the FRITZ!Powerline adapter so they can access your home network and the internet. To do so, set up the wireless connection on each device just once as described here. Then the wireless device establishes the connection automatically. 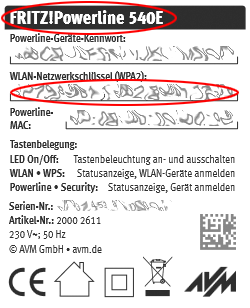 You can manually set up the wireless connection by entering the FRITZ!Powerline adapter's unique network key in the wireless device. The name of the wireless network (SSID) corresponds to the model name of the FRITZ!Powerline adapter (for example FRITZ!Powerline 540E). The network key corresponds to the numerical code in the field "WLAN key". In the list of available connections, click the one that displays the name of the wireless network (SSID) of the FRITZ!Powerline adapter and then "Connect". Enter the network key for the FRITZ!Powerline adapter in the field "Enter the network security key" and click "Next". Enter the network key for the FRITZ!Powerline adapter in the "Security key" field and click "OK". Select the wireless network name (SSID) of the FRITZ!Powerline adapter from the context menu. Enter the network key for the FRITZ!Powerline adapter in the "Password" field and click "OK". Under "Choose a network..." tap the name of the wireless network (SSID) of the FRITZ!Powerline adapter. Enter the network key for the FRITZ!Powerline adapter in the "Password" field and tap "Join". Note:You can also use FRITZ!App WLAN to easily connect your Android device to the FRITZ!Powerline adapter and have FRITZ!App WLAN display useful information about your wireless connection. Enter the network key for the FRITZ!Powerline adapter in the "Password" field and tap "Connect". Select the wireless network (SSID) of the FRITZ!Powerline adapter and enter FRITZ!Powerline's network key , if asked to do so.